"a state located in the southeastern United States. It was established in 1732, the last of the original Thirteen Colonies. Named after King George II of Great Britain, Georgia was the fourth state to ratify the United States Constitution, on January 2, 1788." Georgia Institute of Technology, University of Georgia, Emory University, Georgia State University, and Kennesaw State University are well-known schools in State as well as overall US. In 2012, average in-sate tuition of GA is $9,233 and out-of-state tuition of GA is $12,003. Public school in-state tuition is $3,066 and out-of-state is $8,648. And private school in-state tuition is $15,309 and out-of-state tuition is $15,309. Next table and chart shows the 2012 average tuition of Georgia State. 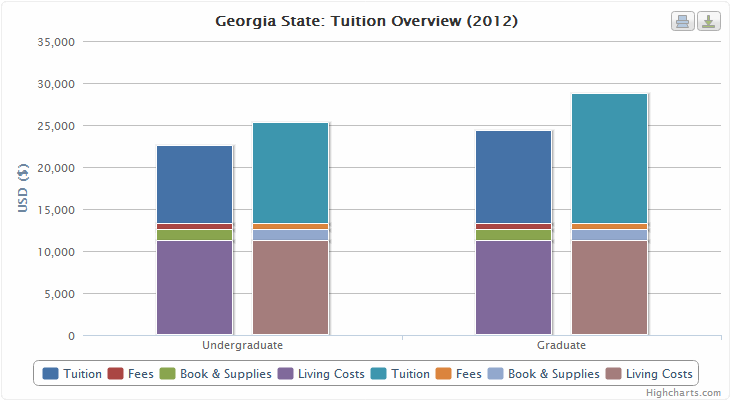 You can see detail comparison and analysis data at 2012 Georgia State Tuition Page. In addition, all colleges and universities in Georgia State list at Georgia State Colleges List and tuition comparison of all Georgia colleges is shown at Georgia Tuition Summary Table Page.